How can the theatre reach a generation that is used to sampling its art before buying? Or, put another way, what is the theatrical equivalent of movie trailers or Spotify? That's the question currently being posed by a new theatre company in town, The Common Room. 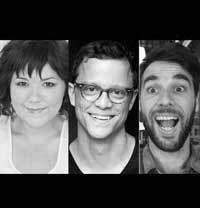 Founders Mary Hollis Inboden, Alexander Lane and Benno Nelson join Anne Nicholson Weber to talk about their current experiment along these lines - a weekly live show, cheap and short, that features scenes from several productions currently playing around Chicago.